The Infectious Diseases Society of America--the Lyme denialists who insist that chronic Lyme doesn't exist, who make it difficult for even those with acute Lyme to get proper treatment, who make it easy for insurance companies to wiggle out of paying for Lyme treatment--is having an annual conference in San Francisco. We're staging a protest demonstration outside Moscone Center on Saturday Oct. 5. Gather with the Lyme community on Howard Street, between 3rd and 4th. Wear lime green if you can. There will be some signs provided, but feel free to bring your own. You might want to bring a bag lunch and a water bottle. Right now, one of the most important ways you can help is to spread the word--via Facebook, email, Twitter, text message, whatever means of communication are available to you. For more information about why we protest against the IDSA Lyme guidelines, go to lymedisease.org. Napa, California on Saturday, May 11th 2013 from 10 to 2 in front of The Napa Valley Expo. People will drop themselves off in a parking lot behind Black Bear Diner adjacent to Home Depot. YOU WILL BE PICKED UP BY A LIMOUSINE with a sign in the window that reads "WORLDWIDE LYME DISEASE RALLY 2013." Hit SOSCOL AVENUE and turn LEFT onto KANSAS AVENUE. After you pass Black Bear Diner (which will be on your right) is the parking lot where everyone will be picked up and dropped off at the entrance of THE NAPA VALLEY EXPO, which is technically on THIRD STREET. Wheel chairs will still be accessible as long as they are collapsible. The limousine will be at our service from 10:00 am to 5 pm. Please arrive in a timely fashion if not a little early. * Recognition that Lyme disease/borreliosis, and other tick-borne infections, such as Babesia, Bartonella, Rickettsia, Ehrlichia, are serious, and sometimes fatal illnesses. * Awareness of the fact that the transmission of tick-borne pathogens, such as borrelia, babesia, rickettsia, via blood transfusion is of global concern. * Agreement that Lyme disease/borreliosis should be listed as a notifiable infection. Notifiable status will aid in ensuring that the incidence and spread of this disease are monitored, a necessary precursor to determining the human suffering and socioeconomic impact of the disease. * Education of the healthcare sector regarding the accurate diagnosis of Lyme, which in some cases may be limited to clinical presentation due to limitations of serological testing. * Education should ensure all doctors are familiar with the CDC caution pertaining to criteria for blood tests for Lyme: "This surveillance case definition was developed for national reporting of Lyme disease; it is NOT appropriate for clinical diagnosis...Surveillance case definitions are created for the purpose of standardization, not patient care." * Education that Lyme should be included as a differential diagnosis when considering other illnesses that are also reliant on subjective clinical presentation, or have no known cause. This includes, but is not limited to: Motor Neuron Disease (MND) also known as Lou Gehrig's disease or Amyotrophic lateral sclerosis (ALS); Multiple Sclerosis; Alzheimer's; Parkinson's disease; Sarcoidosis. * Funding for research into tick-borne diseases. Including: Funding for medical research into accurate Lyme testing and treatment; Funding for research into vectors and reservoir hosts to determine what diseases they may carry and transmit. Our latest fundraiser was a huge success! We hit our goal, raised awareness for Lyme Disease, and formed many valuable friendships. The outpouring of support was truly touching, we are in awe, and feel blessed to be a part of an amazing community! Gratitude, if you look it up in a dictionary, is "feeling appreciation". This does not describe the power of feeling gratitude. For me, it is "A deep, in every cell, feeling of thankfulness". When I feel grateful for something, it fills my heart with joy, and every cell of my being experiences this joy. I am filled with gratitude! Every moment I am experiencing a deep abiding gratitude for everyone who took part in helping to raise enough money to have a successful Indiegogo Campaign for Inanna House. donate their art, books and other goodies so that those that gave received as well. I am forever grateful to Sarah. Throughout the campaign she was diligent and attentive to the process of working for success, despite her own struggles with Lyme disease. She is one of my heroines! Sara Donnelly, who took our vision of Inanna House and shared it with you all. She has created and maintained the websites and social media platforms, building valuable relationships and keeping them active and interesting. Without her efforts, we would still be dreaming about this project. There are many individuals who posted daily, asking their friends and family to participate and donate. We could not do this without you! And to those of you who did donate, I honor you! Thank you. Thank you. Thank you. We loved all the support we received through our community of bloggers. Check out some below! 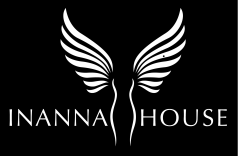 "Help Inanna House Spread Its Wings"
IndieGoGO is the world's largest global funding platform. Founded on the principles of opportunity, transparency, and action, anyone with an idea – creative, cause-related, or entrepreneurial – can create a campaign. They believe that everyone should have an opportunity to raise money. People all over the world use IndieGoGo to raise millions of dollars, and now it is our turn! Click the photo on the left to view the "Help Inanna House Spread Its Wings Campaign" on IndieGoGo. The more views the better! The "Help Inanna House Spread its Wings" campaign is set at a goal of 20,000 dollars. There are different levels to contribute at, and each level has its own set of "perks". The more you donate, the more you get back. We have 45 days from when we launch the campaign to raise our goal amount. If we make it, then all perks will be given and donated money will be received. If we do not reach our goal, then we do not collect anything. So check out the campaign. A lot of a little adds up! Indiegogo is a merit-based platform where the most active campaigns are featured based on a unique algorithm called the gogofactor. Based on the gogofactor activity, we may be eligible for exposure in their social media outreach, community and content creation, and press access. This is how Indiegogo helps to generate excitement and interest in our campaign! Basically, if we work hard on the outreach, they give us a boost. So another important part of this is to share, so more people know about us and our campaign. We need people to view the campaign and contribute in any way possible. We can not stress this part enough! Click here to use the IndieGoGo social tools (located right below the video on the IndieGoGo main site) to start sharing, tweeting, and encouraging people to view our campaign. For the past 5 years I've both experienced and been witness to countless acts of unimaginable suffering, loss, fearful uncertainty, and utter despair from the lack of resources, financial support, and understanding within the Medical Community and beyond for the millions of people diagnosed wth Chronic Lyme Disease. It has been an experience I pray none of you will ever know, as the sheer magnitude of it is enough to literally break someone's soul and have them lose faith in humanity itself...I know because it almost happened to me. When I found Inanna House, however, and felt the sincere wamth and infallible integrity from its founders, I simply knew that there was an answer; a vision I could hold onto for dear life - one that could grant me the courage to fiercely fight to see it built, as it would not only restore my faith, but it would also PREVENT all of us diagnosed with this condition from losing theirs. And, like I said before, that is everything I could ever wish for. The first Inanna House Fundraiser was an amazing success. We were so honored and proud to have had the opportunity to share our vision with so many supportive people. The day started off chilly, but as the guests started to arrive, and the room began to fill, the abundance of loving hearts and hopeful souls warmed the room. The bar was a great place to mingle as people became acquainted with each other. There was wine, as well as yummy snacks. Lunch was served shortly after all guests had arrived. We were so thankful for the delicious food prepared by Arturo Cardenas of Portofino restaurant in Santa Rosa. His gluten-free, organic dishes were a perfect way to showcase one of the ways Inanna House will bring health to patients. Founder Mara Williams, Dr. Eric Gordon, and Author Katina Makris were the featured speakers. Mara Williams spoke of her vision of Inanna House, and where it originated. "You are here so you know this is important. If this project is to be realized, to be more than a dream, it is going to take a series of small and large miracles and some wonderful energetic connections. disease), I knowingly smiled and rolled my eyes. I have heard many plans of and been involved in some attempts at delivering comprehensive care to people in the past, and had seen them all fail when the money or energy ran out. Mara was ahead of me in planning, she knew she needed an endowment. I knew the sum needed was large and so wished her luck. I realized that instead of discouraging her, my words just helped her focus and she came back with the breathtaking sum of 25 million, and instead of giving up she went out to start making it happen. That is when I got interested in being involved. In order to succeed we need to attract lots of donors and to do that people need to know why this is so important. And why many well meaning physicians will shut you down when you mention the need to help those with chronic Lyme. I am going to give you a brief overview of what is special about the needs of these patients and why most doctors don’t get it. There are lots of ways our bodies can be ill. Why do those with chronic Lyme, or as I like to call it, chronic complex illness, need their own place? Why isn’t the standard hospital and rehab center good enough? Hospitals have slowly begun to realize that people do better when there is some attention to the physical and emotional needs of patients and they do try to provide care above the utilitarian basics. There are some hospital-like settings in Europe and Mexico that offer something similar to what Inanna House is hoping to do. These still don’t come close to the inclusiveness that is part of Mara’s vision. They are fairly expensive and generally have a well defined approach to healing that will serve some, but will not help if you don’t fit their paradigm. If this was just a dream to give better treatment to people with chronic TBD it would be important, but what should be understood is that without facilities such as Inanna House many people will not receive appropriate treatment. They will suffer and some will die. Wealth almost always gets you better care, but usually even those without resources get the basics in America. Not so with Lyme. Even the wealthy get neglected when they have chronic Lyme disease. The failure of the medical system to comprehend chronic inflammatory illnesses that fall outside a few well defined diagnostic boxes is amazing. It is a product of our current medical and scientific educational system. Factory medicine is designed for and is brilliantly effective in the acute stage of most illnesses. Think war injuries. That’s where big intervention medicine has its roots. Asclepius tended the Greeks at Troy before he was made a demigod – this is good stuff – it will save your life. The miracles of modern medicine are mostly based on battlefield medicine. Not many vaguely healthy people die of infections anymore- that used to be the main cause of death. Same with major injuries – get to the hospital and even if you are fairly mangled they can put you back together. Our hospitals were developed on the strict hierarchical structures of the army. The biggest change is that for awhile the doctors were the generals and now the accountants and statisticians are. Where modern hospital medicine shines brightest is when people are in critical condition or suffering from acute illness or trauma, medicalese for “it just happened.” With an acute appendicitis the hospital and surgeon is a good bet, but they are useless for preventing the problem and not much help for recovering well. With acute Lyme (acquired within the 6 weeks), it often responds quickly to oral antibiotics and probably herbs, as well. In many people their own unaided immune system will do the trick. But many people are not diagnosed with Lyme within 6 weeks of being bitten. The tick is not seen, symptoms don’t develop, or they are not specific enough to cause suspicion of Lyme disease. The disease is there, but no one notices it yet, or at least it is not identified. If the person’s immune system is not strong enough to keep the infection under control, or another stressor leads to the infection coming out of hiding, it is already well entrenched. When we get past acute Lyme disease to Lyme disease that has been around for 6 months and more – we are now in the land of chronic Lyme. Chronic Lyme is not the land of black and white diagnosis or treatment protocols. Tick borne diseases when they persist don’t fit the military model of health care at all. This is where patients fall through the cracks in the current health care system. Because the illness is not understood, patients are marginalized, stigmatized, mistreated, or left untreated at all. Every patient is different – there are people who will respond beautifully to IV antibiotics and others who will crash and burn. What is right for one is poison to the other. This is one reason chronic Lyme is poorly understood. Now is when Hygea – healthy living and health promoting environments are needed to balance the Aesclepian modern hospital. This is about balance- we need both acute intervention and supportive care- which is more important depends on the situation and the individual patient. With Inanna House, we are offering both." Katina spoke about her personal journey with Lyme disease and how she found hope and healing using Homeopathy. After the lectures the floor was opened for questions, and there were plenty to go around. Oh, wow. It felt so good to be surrounded by such incredible human beings! The energywas so positive and supportive in the direction Inanna house is moving in with regard to treating Lyme Disease. The speaker panel was down to earth and spoke with such heart. Hearing Mara and Katina’s stories moved me to tears. They have such courage, and conviction. I know a lot of us have similar life experiences with having Lyme disease. It was held in the place where the wine tasting bar was. Beautiful knotty pine walls made it a cozy & inviting atmosphere for me. Thanks again for your part in helping me get there. Inanna House is so thankful for all those that pulled together to throw an amazing event. The food and wine were delicious, the speakers were knowledgeable and entertaining, and the guests were fun and encouraging. Inanna House is proud to be part of the Lyme community. Plans for the next fundraiser are already in full swing. If you would like to help and get involved, Contact Us, we would love to hear from you! A Special Thanks to Our Sponsors and Helpers! Inanna House foundation provides treatment and care for people infected by Lyme Disease. In our campaign to raise awareness and support for Lyme-infected patients, we are building a treatment facility to educate, treat and begin the recovery process of Lyme patients. Chronically ill people need supportive care, education and treatment to get well. Based upon a new paradigm in healing and health care, Inanna House will integrate the best of all health modalities to achieve optimum results for clients. Katina Makris, author of Out of The Woods will be the key-note speaker. Other speakers will include Mara Williams, author of Nature's Dirty Needle, and Dr. Eric Gordon from GordonMedical Associates. They will talk about Chronic Lyme Disease, the need for awareness, and Inanna House. This inaugural event will be held on March 25th at Running Rabbit Ranch and Vineyard. All proceeds will go the foundation for Inanna House and support Lyme literacy. A gluten-free, organic lunch is provided to showcase one of the ways the clinic will help return people to good health, as well as a raffle with great prizes.